Learn how to activate all the Heroic Public Events in the world of Destiny 2. In the early days of Destiny 2, completing Heroic Public Events is the best way to get yourself an Exotic Engram. That might seem odd, but many players are finding that, due to how quickly they can be finished, Heroic Public Events are better for Exotic Engram farming than Strikes, the Crucible and even the Nightfall. Today, we’ll show you how to trigger each of the eight Heroic Public Events so that you can push beyond the 265 Power level that’s holding players up these days. Work the Cabal Excavation Public Event as you normally would. Stand near the device and wait for the Overriding Lander to reach about 30 to 40 percent. It’s now that a ship called Thresher will fly in. The key to activating this Heroic Public Event is to destroy it before it can escape. It should make a total of two passes before it leaves for good and you’re stuck with the regular Public Event. Once it shifts to a Heroic Public Event, your task is to defeat Excavation Valus. During this Public Event, a small Glimmer refinery will show up near the drill site. If you ignore them, a maximum of three of these devices can show up at the third site. The key to activating the Heroic Public Event is to destroy a total of three Glimmer Refinery devices. This will cause the drill to explode and drop the Glimmer in a pile on the ground. Guardians must now stand in the ring and capture the pile of Glimmer while simultaneously fighting off the Fallen. During the purge phases of this Public Event, vents will open on the side of the rig. There are three tiers of vents (top, middle and bottom), and three purge phases. The first purge phase will see vents on the top open, the second will see vents in the middle open, and the third will see vents on the bottom open. If your team can destroy all three tiers of vents before the end of the third purge, and defeat all the Psions, the Heroic Public Event will trigger. Now you must defeat Valus Centurion. Begin by doing damage to the boss and dealing with the Fallen. When a small Transport Servitor arrives, destroy it before it disappears. Damage the boss. When two Transport Servitors arrive, destroy them before they leave. Damage the boss. When a wave of three Transport Servitors arrive, destroy them before they take off. This will turn Ether Resupply into a Heroic Public Event, at which time you must defeat the main Servitor to successfully complete it. 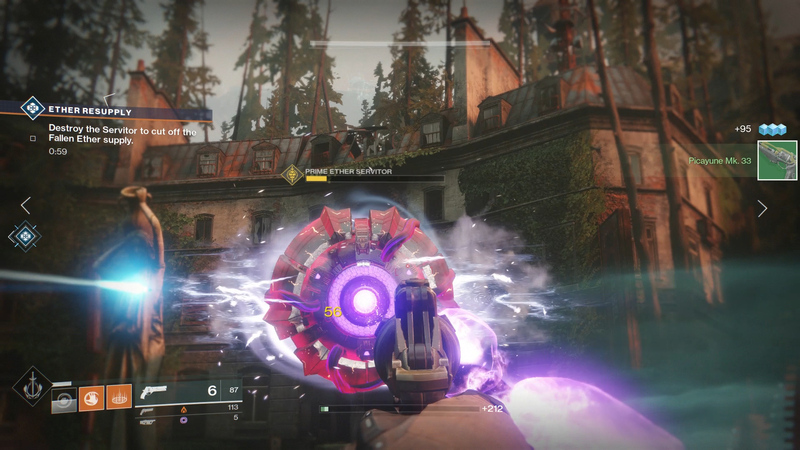 Although the main goal is to prevent Vex from sacrificing themselves to the Conflux, triggering the Heroic version of this Public Event requires you capture three plates that appear in the area. As you stand on a plate it will begin to form, and Vex Fanatics will spawn and run at you to sacrifice themselves to stop you from capturing. More Guardians capturing a plate means it happens faster. When three plates are captured the event turns Heroic. During the Taken Blight Public Event there will be Blights with a shield on them spawning in the area. There’s one for the first round, two for the second, and three for the third. The goal is to destroy the giant, unshielded Blight in the center, using the buff supplied by the smaller Blights. Once the large floating Blight is destroyed, a Taken boss will spawn, signalling the beginning of the Heroic Public Event. Damaging the leg of a Fallen Walker will cause it to collapse, at which point Arc Charges will fall from the machine. Take these and put them into the devices near the Scorch Cannons. Each Scorch Cannon (there are three in total) has two devices powering its shield. Once you unlock all three Scorch Cannons you will trigger the Heroic Public Event, spawning in a second Fallen Walker that you must deal with. The good news is that you get to use your newly acquired Scorch Cannons to whoop them. You trigger the Heroic version of this Public Event after you kill the first two Wizards, but before the final Wizard appears. To the left and right of the portal are pillars, and on these pillars, are shielded Hive crystals. Remove the shields by capturing the plates in the room, then focus your fire on one Hive crystal at a time. Destroying one gives you more time to destroy the next. Once both Hive crystals are destroyed, the Heroic version of the Public Event will trigger, spawning in a Darkblade Knight. Have fun. To turn the Vex Crossroads on Mercury into a Heroic Public Event, players must kill floating diamonds after dunking the charge in the islands off to the side. After using the man cannons to reach the outer platforms, defeat the Vex units and dunk the charge, but before taking the cannon back to the center, look for the diamond that has just appered. Destroy the diamond to spawn a platform that can be used to spot the next diamond, and so on. Complete this process of destroying the diamonds and jumping on the platforms to reach the very top where a Vex sync plate will be. Stand on the plate to activate the Heroic Public Event. The Warsar Down Public Event on Mars is slightly different to the version that appeared in the original Destiny though most of the functionality is the same. Standing nearby the Warsat will capture it, though to turn it Heroic, players must destroy the three Shreikers that float listlessly nearby and kill the Ogre boss. To open up a Shreiker, players must kill the Wizards and high-level enemies that spawn, at which point one Shreiker will open and be susceptible to damage. Repeat this process until all three are destroyed, at which point the event will go Heroic and a large Ogre will spawn. Defeat the Ogre before the time runs out to complete the event. The Ether Harvest Public Event is likely the most difficult event to turn Heroic in all of Destiny 2, not because of the enemies but due to how fast players must be. Whenever one of the miniboss Scorn are killed, several white wisps will errupt from the rubble and float toward the center. Players must destroy all of the white Ether wisps, ensuring none of them make it to the hub. This must be accomplished three times at all spokes before the Ether Harvest event will turn Heroic. Once this Public Event is Heroic, a large Scorn boss will spawn which must be defeated. The Cryo-Pod Escape Public Event can be turned Heroic by freezing the escapee instead of killing it. In order to freeze the enemy that pops out of the cryo-pod, players must deal damage to the escapee until the pod starts steaming. Locate the sections that are steaming and destroy them, which will eject an orb. Pick up the orb and throw it at the escapee; do this with three orbs to freeze the escape and turn it Heroic. The Rift Generator Public Event of the Dreaming City can be turned Heroic by defeat all the large Blights that appear and then killing the Wizards. During the wave-defence section of the Public Event, large Blights will spawn along the channels where the enemies appear. Destroy each Blight as quickly as possible, ensuring none are missed, and the event will turn Heroic. At this point, the fight will be taken into the Ascendant Plane where players must defeat several Taken Wizards to unlock, and then kill, a large Taken boss. That’s all the Heroic Public Event triggers in Destiny 2. Some of them are easy, and some are very hard to pull off in small or under-powered fireteams. To increase your Power and equip yourself for the long road ahead, visit the Shacknews Destiny 2 complete strategy guide.